NEW YORK, NY--(Marketwired - Dec 6, 2016) - Demand Energy, a leader in intelligent energy storage systems, today announced that it will design and deliver a lithium-ion battery system as part of the first microgrid to be deployed under Con Edison's Brooklyn-Queens Neighborhood Program (BQNP). The multi-resource microgrid will be implemented at the 625-unit Marcus Garvey Apartments in Brooklyn, owned by L+M Development Partners, a large owner/developer of affordable housing. The microgrid comprises a 400-kW solar PV system and 400-kW fuel cell, supported by 300-kW / 1,200-kWh lithium-ion batteries and controlled by Demand Energy's Distributed Energy Network Operating System (DEN.OS), which optimizes how these resources interact and perform. The system will reduce the property's power consumption by managing the generation and storage of renewable energy to save money through demand charge reduction. It will also provide resiliency during an outage, lower operational cost, deliver essential load relief for Con Edison, and help reduce greenhouse gas emissions. A key technical aspect of the project is the ability of Demand Energy's DEN.OS to ensure that the housing development self-consumes any energy it generates, without exporting to the grid. This capability directly aligns with Con Edison's BQNP requirements, which facilitated the interconnection and permitting process. Electric load relief is needed in New York City during peak summer periods to avoid over-taxing existing substation resources, which can lead to power interruptions and cutbacks. 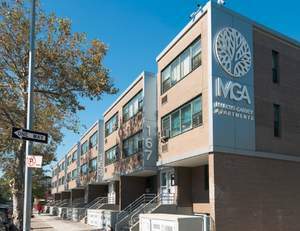 L+M has made significant investment in Marcus Garvey Apartments, a 625-unit low-income complex in the heart of Brownsville, which is the primary substation strained by summer operations. The operational savings will enable L+M to place additional funding toward programs that enhance quality of life for tenants. "L+M is excited to integrate this intelligently controlled, energy storage-based microgrid system at Marcus Garvey Apartments," said Josh Weisstuch, Project Manager at L+M Development Partners. "This installation is an important part of a portfolio-wide effort to use renewable energy to enhance property sustainability and residents' quality of life in line with our double bottom line approach to development. "This high-value microgrid is a flagship system for New York City and for the partners involved," said Doug Staker, Vice President of Global Sales for Demand Energy. "The project is impressive for many reasons: it will save money, reduce load, ensure reliability, integrate renewables, and decrease emissions. It's also being financed through non-recourse debt, which is standard in the solar industry but far less common for storage projects." The New York City Energy Efficiency Corporation (NYCEEC), a non-profit finance company that offers loans and alternative financing solutions for energy efficiency and clean energy projects, provided a 10-year project loan. L+M and Demand Energy have agreed on a "shared savings" operating model to cover debt service and share in revenue generated, allowing both to collaborate to produce the greatest return possible. New York-based GridMarket worked closely with Demand Energy to successfully present the project to L+M. GridMarket CEO Nick Davis commented, "This is an innovative project with tremendous benefit to the customer, the community, and a constrained electric grid. Demand Energy expertly navigated technical and financial complexities to win the deal through GridMarket's marketplace, creating a blueprint for future installations." Demand Energy's DEN.OS™ is an intelligent software control platform that reduces peak demand while maximizing economic returns from behind-the-meter storage systems alone -- or in combination with distributed generation resources, such as fuel cells and solar PV. Demand Energy has been deploying energy-saving, revenue-generating storage systems in New York since 2011, and was recently awarded additional projects under Con Edison's ongoing BQNP procurements. Con Edison's BQNP is the largest and most comprehensive non-wires alternative distribution project in the country. The utility's goal is to delay the need for a new $1.2 billion substation, largely using demand-side resources such as energy storage, energy efficiency and demand response. This storage-based approach provides significant savings, reduces emissions, and accelerates implementation of a more flexible and sustainable solution. Founded in 2008 and led by a team of seasoned entrepreneurs from the telecom, utility and renewable energy industries, Demand Energy has developed a best-in-class Distributed Energy Network Optimization System (DEN.OS™) that maximizes the economic returns of behind-the-meter storage systems alone, or in combination with distributed generation (DG). The company provides a turnkey solution (hardware, software and services) that ensures clear accountability by tying together upfront modeling, design and simulation, with the installation and operational monitoring, control, and financial optimization required to deploy storage-plus-DG solutions at speed and scale. The DEN.OS software platform was architected as an end-to-end solution that delivers differentiated value across the entire project life cycle, and can support both utility-side and behind-the-meter projects. For more information, visit www.demand-energy.com. GridMarket is a distributed energy project facilitation platform, simplifying and expediting project development for energy consumers, solutions providers, governments, and utilities. The platform reduces soft costs and shortens timelines by connecting pre-qualified opportunities and development data to best-fit solutions providers. GridMarket analyzes distributed energy project potential and warehouses critical intelligence to identify and actualize financial benefits, enhance property performance, and reduce energy consumption. The GridMarket platform consists of a project portal hosting live opportunities seeking proposals, and a searchable database of energy, building infrastructure, market intelligence, and technology recommendations across over 1.4 million properties. About this company Demand Energy, Inc.
An intelligent microgrid will be implemented by Demand Energy at the 625-unit Marcus Garvey Apartments in Brooklyn, owned by L+M Development Partners.